Did you like what you saw here? Do you want to swap pictures? Do you want pictures? Do you have pictures to share? If you do or you just want to talk E-mail me!!! This is a picture of my sisters and I taken sometime earlier this year. 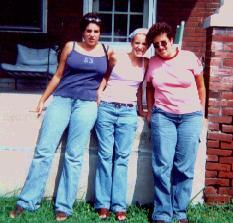 On the left is my sister Gwen, in the middle is my sister Alex, and on I'm on the right.